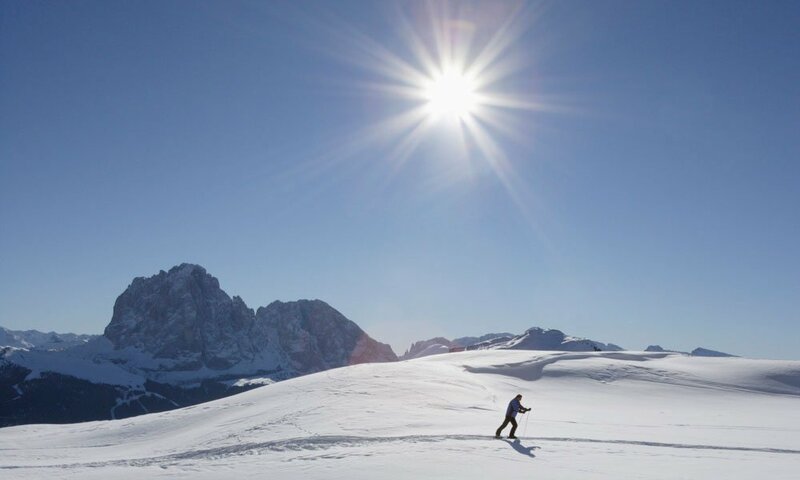 The stunning backdrop of snow-covered mountains makes South Tyrol a paradise for cross-country skiing fans. Cross-country skiing is particularly popular in the Isarco Valley. Which is not surprising, since there are as many as 24 cross-country trails of varying difficulty. Thus, the trails around Funes combine natural beauty with sporting challenges for the entire family – from beginners to professionals. A very welcome side effect of cross-country skiing in the Isarco Valley is the fact that during the sporting activity in the wintry landscape you may leave the worries of your everyday life behind. The most popular cross-country trails in the region include the circular trail Zannes Alp and the trail between the intersection Russis and the cross-country centre Passo delle Erbe. The former has a length of two kilometres and is considered easy. This makes it the ideal track, if you wish to practice cross-country skiing in the Isarco Valley with your family. The trail between the intersection Russis, the alpine lodge Halslhütte to the cross-country centre Passo delle Erbe is 18 kilometres long and of moderate difficulty. If you wish to use your winter holidays to get a first taste of cross-country skiing, you don’t need to bring you own equipment. Cross-country skiing equipment is available at the rental station at the village ski lift and at the shop Sport Schätzer. For those guests, who have no cross-country experience at all, the Ski School Funes offers group courses as well as private lessons.